Wow! That was so much fun! We need to do that again. Those are the things we were saying at the end of the night last night. We had just finished enjoying an entirely new experience. We watched a movie on a huge screen in our own backyard. It was so much fun! We lounged in Adirondack chairs (made by Tim), snacked on Kettle Corn (made by me) and enjoyed peanut M&M’s (clearly sent from above). All the while we enjoyed a wonderful springtime seabreeze and had an incredible view of the starry night sky. Oh, and the movie was great too! We watched Seven Days in Utopia on NetFlix. It’s a great movie and had nothing at all to offend the family nature of the night. This tiny projector, about the size of a walkie-talkie, has a (removable) rechargeable battery and plugs into your iPad, iPhone or iPod Touch. If we didn’t insist on a louder external speaker (plugged in through a headphone jack on the projector), we could have run the whole thing completely “unplugged” because the projector has its own built-in speaker. 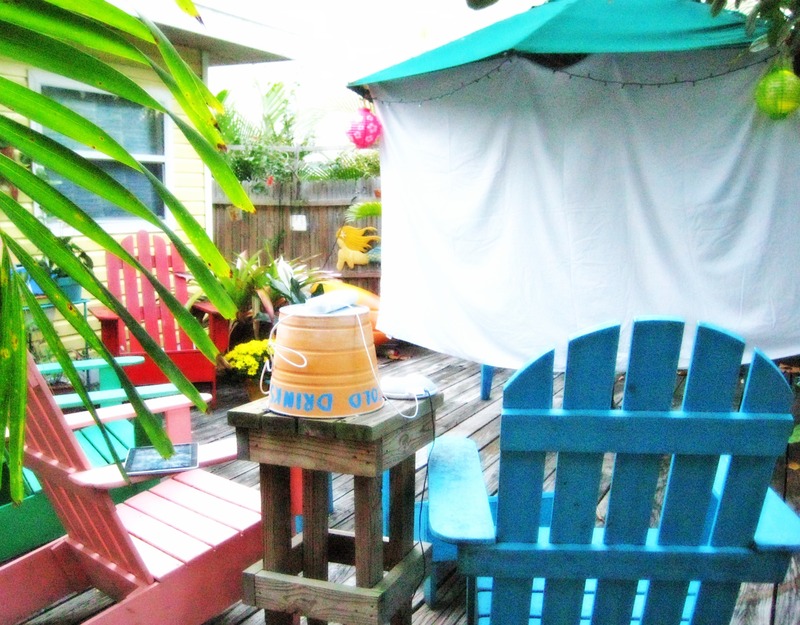 We hung a huge white sheet up under the market umbrella that lives permanently on our back deck. A few strategically placed metal clips and bungee cords and the “screen” was really pretty great. We didn’t notice the few wrinkles at all and the little bit of motion from blowing in the wind actually added to the ambiance! We set the projector, the iPad and the speaker on a barstool about 9″ from the screen. The result was a HUGE picture almost 6′ wide. Larger than an 80″ TV. The picture clarity was surprisingly great, especially after it got really dark out. I guess you can’t call it HD on a sheet blowing in the wind, but even the text in the credits was clear and legible. You know what was really cool? The beam of light shining from the projector. Little dust particles and bugs would get lit-up flying through it and it made the whole thing so “vintage” movie-like. Reminded me of the projectors we had in elementary school. You can buy an optional cord for this projector that allows you to project anything from your computer screen. That pretty much opens up a whole world of options. But we didn’t have that cord. Bring it to the beach and have a movie night on the beach! Hang a sheet on your car for a screen. Take it camping and watch videos in your tent! The speaker isn’t very loud and you can’t project a picture very far (or large) in bright surroundings. The more space between the projector and the screen surface (which can be anything white-ish) the darker it has to be in the room/outside. The sound issue is easily solved through the headphone jack connected to external speakers or headphones. (get a headphone y-splitter and two people can use headphones together). The brightness/dark-room issue is pretty just much the way it is with projectors. Overall, for a package so small and so simple, I’m pretty impressed. And boy did we have fun. We’ll be doing that again very soon! You can win a $150 Target Gift Card. Leave a comment below telling me how you do family movie nights. This sweepstakes runs from 5/21/12 – 6/29/12. 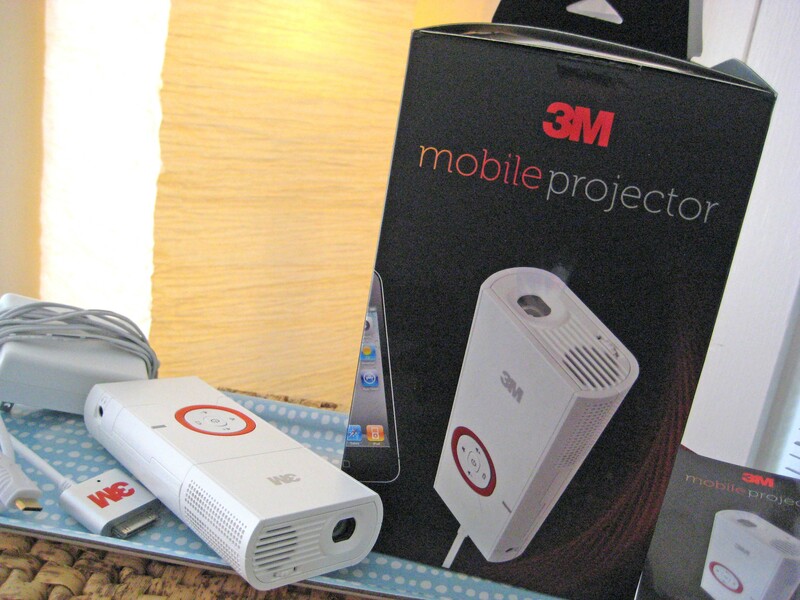 Be sure to visit the 3M Mobile Projector brand page on BlogHer.com where you can read other bloggers’ reviews and find more chances to win! The backyard movie sounds really cool! We are cramped for space, and so must do a movie indoors. Popcorn for the big folks, a chip or two for the littlest and a snuggle on the couch. We recently introduced our two boys to E.T. and they loved it! We usually just rent a movie from Redbox, cuddle up on the couch with the kids and enjoy. This looks like much more fun and could be great for our summer camping trips! This sounds like the best family movie night ever! Would love to win! Maybe a good idea for my son’s birthday party? Hmm! Thanks for the inspiration! friday night is family movie night. it’ the one night where we all just sit and chill out, spend time together as a family. we live for friday nights! Mama and I love to watch old classics. A little buttery popcorn and the DVD player allows us to enjoy a different movie every tursday night. If we had this neat little projector we could invite the kids, grand kids and the “greaty” ones to a backyard lolipuloosa!! Who says you’re too old!! Be a great way to remember and share memories of going to the drive-in with family no longer here. I would sooooo love to do outdoor movies! We have a long garage right next to our patio that would work perfectly…actually watching a HUGE Yankee game would be fun too! Movie nights at our house are done inside – pizza, soda (a very rare treat for the kids) & we each take turns picking the movie for the week – I spare the 2 guys anything too sappy but my picks usually are the more ‘nerdy’ ones lol. Thanks for the giveaway! I’ve always wanted to set up an outdoor movie space for those hot Texas summers when it’s only bearable outside when the sun goes down. family movie night at our house means chocolate popcorn! Thats awesome!! I’ve seen one in action before. Our family movie night are pretty spontaneous, in the living room with some popcorn, nachos, or ice cream. Family movie night usually involves us lying in bed watching a Mickey Mouse or Barney movie with our 2 1/2 year old! I enjoy a good movie, and prepare a big home made popcorn bowl. We just got Apple TV and have been popping popcorn and snuggling on the couch together. We like to throw a bunch of blankets on the floor and get a bunch of snacks. Each week someone different gets to choose the movie and we snuggle in and enjoy! My children are all grown up now so family movie night is just my husband and I now. It’s a pretty simple night…but popcorn is a must. But as my grandkids get older that will be changing. I can’t wait to try something like your outdoor movie! We rent a movie and pop some popcorn. They take turns picking the movie we all watch together. Family Movie Nites – we rotate who gets to choose. Then we have make your own ice cream sundaes and popcorn with M&Ms tossed in (for that sweet/salty taste). Would love to try the outdoor movie with family and friends. What a fun way to do movie night. Lately we’ve done ours indoors, many times huddled around the computer monitor (Amazon movie rentals). It’s cozy for the hubby and me. We’re cool with that. I get DVDs from the library. Otherwise it’s Netflix Instant. we love watching scary movies with all the lights out and lots of snacks! This is great! We’ve done the “backyard drivein” with a power point projector borrowed from Hubby’s employer, but we have to plan way ahead and never know if work will trump our reservation on it. We built a screen out of pvc and leftover tyvek house wrap – it is very durable and nicely reflective, so we get a nice bright picture. We even found the old “drive in” animations to do intermission – we run the whole thing off the laptop. We go to a campgrounds every year that has a big screen and projector. Movie night outdoors is the best and we always have ice cream. 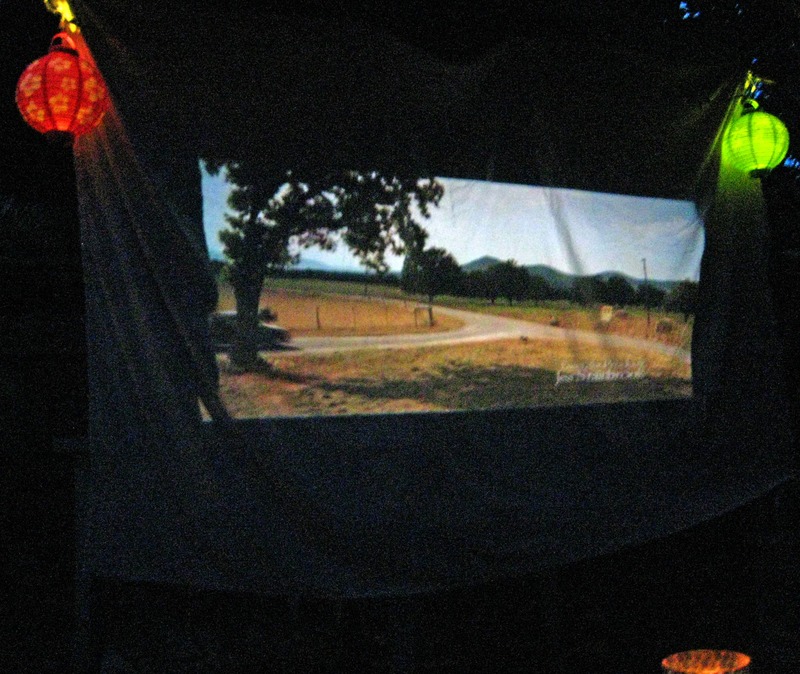 I love the idea of having your own projector and hanging a sheet from the car to watch movies. That would be a blast! What a fabulous sweepstakes! We had outdoor movie night for the kids in our neighborhood last year and they are all asking about it again for this summer…..what a fabulous addition a projector would be! Fingers crossed!! best way – BUTTERED POPCORN!!! definitely pop some popcorn w lots of butter and salt, turn on our big tv w surrounds sounds and recline in the theatre seating we have. FUN!!! My family always does movie night in the basement on the bigscreen tv. We’ve never tried outside before, but now I really really want to! And I actually read the official contest rules. LOL! Thanks for the second chance! We have actually used another device for outdoor movie nights, it was borrowed and I thrilled to see an affordable option like this! What a great party this would be. Our movie nights are boring compared to what they could be with this device. I love the idea of craft shows and displaying your own work. The ideas are endless! My kids would not need snacks if we watched movies outside & they could run around. This is on our summer bucket list!!! Family/friends and a great movie what could be better!! :) thanks! we have the tiniest backyard so an outdoor bit isn’t possible but we have a “sleep over” type where we bring all of our blankets & pillows & lie on the floor as we watch the latest kid movie that’s come out. Would be a great idea for a party for kiddos as well as family night. We do Netflix night. Let the kiddos camp in the living room or all pile in our bed and watch a movie. If its cool enough we pile them outside the bounce house and let them watch on the iPad. How cool it would be to projr t it on the house. We’ve had campsite movie nights. This projector would be great for that–and a lot easier than carrying a big projector along! We sometimes all huddle around our little fire pit and watch a movie on our portable dvd player. It’s a small screen, but the kids still love it! We don’t own a TV, but we got a large monitor for our desktop computer. Most of our family movie nights involve Netflix or a Redbox DVD. Occasionally, though, we cuddle up in our king sized bed and watch something on a laptop. Great fun, either way! My favorite movie nites don’t happen all the time,. It is when I get to visit my granddaughter and we snuggle on the couch with popcorn and get to watch a movie we love. We pick old movies to rent from the library and complete the night with homemade popcorn. A backyard movie night sounds so fun! Thanks for hosting this giveaway! Our movie nights use family films that both the adults and kids should enjoy. We make popcorn, pile up on the couch, and enjoy ourselves. We like to order pizza and pick out a movie that the whole family will enjoy! pizza and popcorn are a must! I love family movie night. My son and daughter takes turn picking a movie to watch (limited to 1 per night though). I’m always the one who prepare the snacks and drinks for our fun night cuddling on the couch. Count me in! Ducks love Target. We usually pick something up at the video store for movie night and pile up in the basement to watch it. But! “Have an outdoor movie night” is on my summer bucket list! So I definitely need one of these little guys! Popcorn, candy, and lots of pillows make the perfect movie night around here! Love the idea of doing this outside. Maybe even on a summer camp out. Great gadget! Movies nights are done with popcorn, herbal tea or sometimes soda and some kind of chocolate. We gather on the couch or sometimes in my bed and watch cuddled up together. Even the teenager. LOL! I would love to use this for my son’s 16th birthday. We’re taking him and 8 friends to our cabin in the woods. Imagine putting up a large sheet, lots of lounge chairs, homemade popcorn and snacks, a nearby bonfire. Could be a fantastic way to watch a fun movie! We just do movie night in our living room like normal. Your sounds so fun — I want to do that when we have a yard! Our family movie night always has board games, pizza/desserts and a great movie to enjoy together. we dont do many movie nights as a family , however we do many family reading nights! Thanks for a super giveaway! I have 3 kids under age 6 and they LOVE family movie nights…we usually get a Redbox and have treats. But it would be so much more fun with this little gadget! Thanks for the chance! My favorite way to do family movie night is to make some homemade popcorn with variety of flavors such as caramel, white cheddar and classic butter and watch movies on Netflix. We pop popcorn, order pizza, and enjoy the movie. Family movie nights mean no electronics while we’re watching the movie! We watch movies on our hdtv with xbox streaming, would love to watch movies in the yard with this projector. thanks for the review and giveaway. Love this idea. I have 2 tween girls (one almost a teen!). They love the idea of hanging out with their friends at night watching a movie! we love to have family movie nights on the deck, but we watch it on the laptop, would love to be able to watch it on a screen against the house! Family movie night consists of family, a movie (of course), popcorn, and root beer! Cuddled on the couch with kiddos tucked under my arms — and lots of popcorn! Wow. Awesome. We love to gather around the TV…some popcorn, theater candy, and rootbeer floats and don’t forget about a great movie. we do them with PJs and popcorn! We relax on loungers and eat popcorn. My favorite is with lots of good food and no lights on. This sounds like so much fun! wireless connection isn’t an option. We stay up late with popcorn and we all pile on the couch. i’m a netflix and redbox kind of gal! so this would be a great change for us! We do movie night with popcorn and sodas! Now that my children are adults with homes of their own it’s just me and the cats and they aren’t big movie fans. So I usually just watch bits and pieces of movies as I do other things. We love making a really big family dinner, usually cooking together. Then we all get in our spots with cozy blankets and settle in for the movie. Simple, but it never gets old! We eat popcorn and snuggle! We like to cuddle on the sofa and eat popcorn while watching movies. so cool! way better than our setup- we do them on the desktop computer because we have no TV! this would be an elegant solution. Movie night would not be the same without lots and lots of snacks! Sometimes we do chocolate covered peanuts with fresh popped popcorn (not that nasty microwave stuff) and its like I am a kid again in the backseat of my parents’ car at the drive in. I love it! We have a big screen TV (not huge though) in the basement and every Friday night we do family movie night. We order from Netflix, pop pocorn, the kids get to choose either a soda or some candy and we watch as a family. We share the couch, turn down the lights and share bowls of home made popcorn! This would be so fun to do outside now that summer is here! !